Javelin Startup-O Victory Fund portfolio company Whizpace, completes one year this month. Co-founder & CTO Pankaj Sharma shares the story about the company’s beginnings and his entrepreneurial journey so far. It is said that when like-minded people meet, magic is bound to happen. In our case, it was the beginning of Whizpace. I was working with Dr. Oh Ser Wah at A*STAR, developing TV White Space technology. He was the head of the department and I was the lab head, in-charge of developing the product. It was the core idea of bridging the digital divide and connecting the unconnected to the world that brought us together to work on Whizpace. We wanted to enable internet access to people in developing countries like India, Myanmar, Malaysia, Philippines and Indonesia. We developed the core technology for Whizpace when we were colleagues at A*STAR. During this period, we talked about starting our own company several times but remained skeptical about leaving our stable jobs. However, when we saw our technology being leveraged for practical applications such as free internet at Gardens By The Bay, Housing Estates in Singapore and island wide in the Philippines, we realised the potential our idea harboured and the impact we could make. This gave us immense confidence and over following conversations and meetings, we changed our collective mind-set and decided to take the plunge into technopreneurship. Whizpace was thus born in June 2016. The concept of TV White Spaces is similar to the sharing economy of Uber and Airbnb. 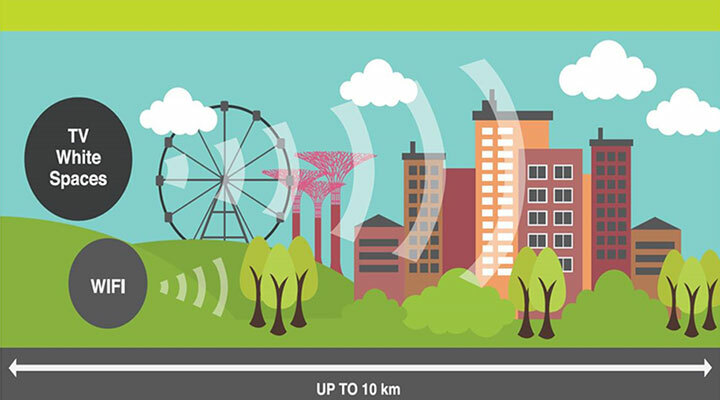 This untapped spectrum can be used to extend the WiFi to cover long distances and penetrate obstacles. Our aim is to connect the world by using the current technology of TV White Spaces by employing the under- utilised spectrum of 470 to 700 MHz. The last one year has been both fun as well as challenging. We were selected as part of the Startup-O ‘Fast-track’ program very early in our entrepreneurship journey. This helped us develop a solid business roadmap, gave us access to a strong network of industry experts and investors and expedited our fund raising process. A year ago we took the plunge into uncertainty but with the overwhelming support of our investors Javelin Startup-O Victory Fund, GreenMeadows Accelerator (GMA) and SPRING Seed Capital, we have built a product that is significantly impacting lives of the O3B (Other 3 Billion). We work with clients across a range of industries, but our primary focus is on the government sector and companies focused on government projects and corporate social responsibility (CSR) activities. Some of our notable clients are from Singapore, Indonesia, India and Myanmar. At Whizpace, it has been an eventful year. We grew our team to 9 people and recently moved to our own space in the heart of the Singapore startup ecosystem at BLK 77, Launchpad. We are busy with multiple pilots and projects in different stages of execution in over 5 countries. It is encouraging to see the interest from across continents for our affordable & impactful technology solutions that provide basic infrastructure to remote areas. However, we know that this is just the beginning and we have a long journey ahead of us. We will continue to work on developing new technologies and embarking on projects that connect the unconnected without barriers.